Architect Nicholas Hunt used his garden as a laboratory for his budding private practice, creating a 55-square-foot studio filled with handcrafted details, including a half-inch reveal surrounding the front window and a Plexiglas skylight. “When a place is this small, the minimal details need to be nice,” Hunt says. The interior features fence pickets from Hunt’s parents’ house and a rotating selection of furniture from his apartment. Just a few blocks from the swooping Barclays Center arena in downtown Brooklyn sits an unexpectedly quiet haven, a petite 1,300-square-foot patch of green punctuated by a small outbuilding. 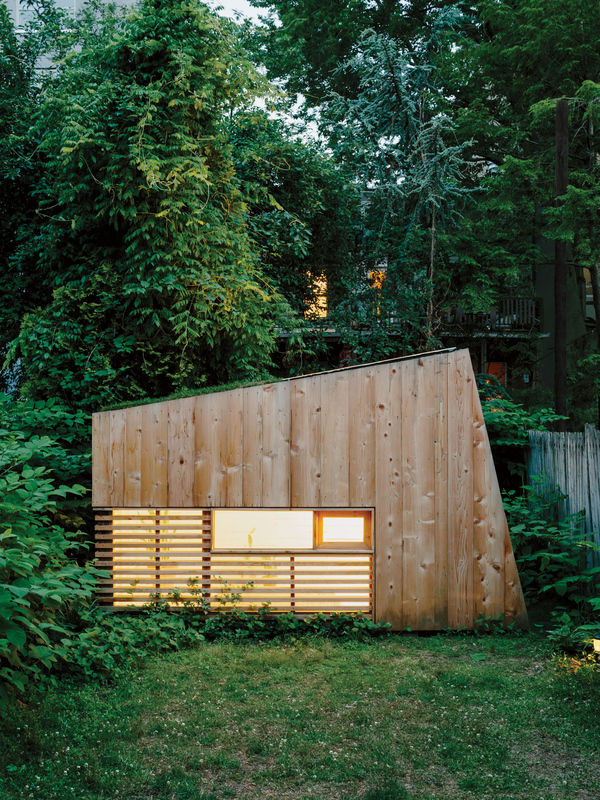 This modest structure, a single room with just enough space for an army cot or chair, was designed and built by architect Nicholas Hunt, who runs the studio Hunt Architecture with his brother, Andrew, in addition to working for larger firms. The 5-foot-by-11-foot studio was completed for just under $1,200, a small sum made possible by the clever reuse of materials, like cedar planks salvaged from another job and the white fence pickets from his parents’ property in Massachusetts that make up the interior. Plexiglas fills a skylight and wood-slatted windows, keeping out prying eyes while opening up the interior to views of greenery and sky.